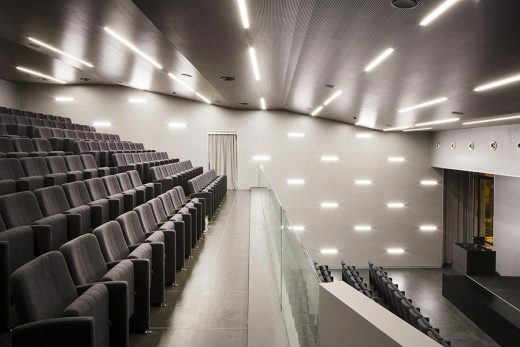 The new Auditorium of the Banca di Credito Cooperativo (B.C.C.) “G. 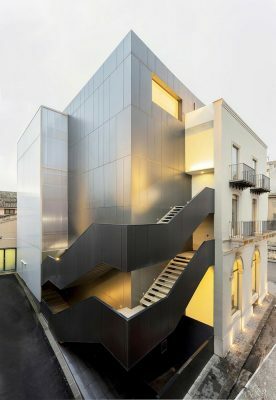 Toniolo” in San Cataldo born from the client’s desire to create a public space for cultural events open to the public and for hosting business private meetings. Then, a space for the residents to meet and share new cultural opportunities, and for the bank activities. 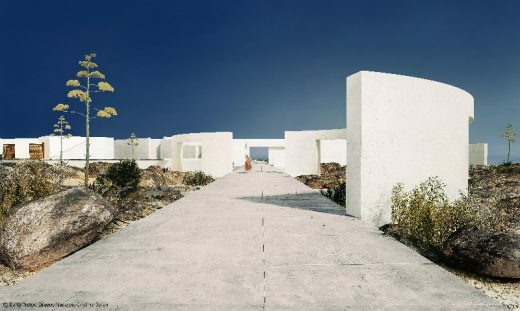 The location of the project is an important issue for the design approach: San Cataldo, a small town in the middle of Sicily, is composed of traditional houses. 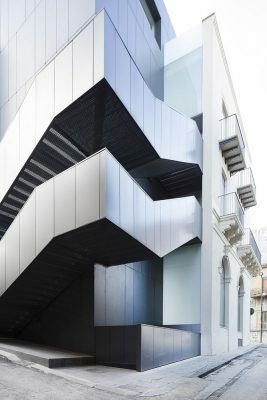 The auditorium is a new urban and contemporary design ‘object’ that comes as an alternative to the consolidated historical center, thanks to the project of FABBRICANOVE Architetti, an architectural office founded in Florence in 2009 by Enzo Fontana, Giovanni Bartolozzi, and Lorenzo Matteoli. The project is situated along the main central street, where there was a cluster of houses with a single front facade, characterized by elements of classical architecture: the restriction of the Superintendence imposed the reconstruction of the original facade that in the project becomes a scenic backdrop. A new volume, designed like a dark and compact monolith, stands behind the restored facade, but it is not hidden. 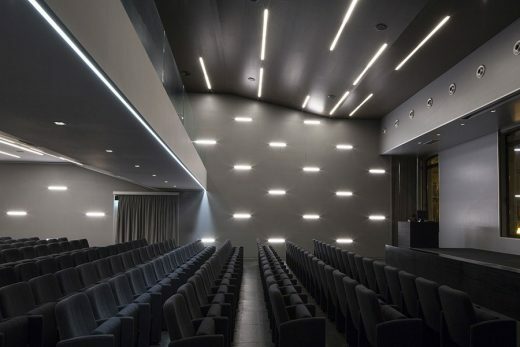 The entire auditorium is designed as a massive embedded diamond that is revealed on the side face, the rear face, and upward: the past and the present come together and invite for a new reading of the urban context and its architecture. 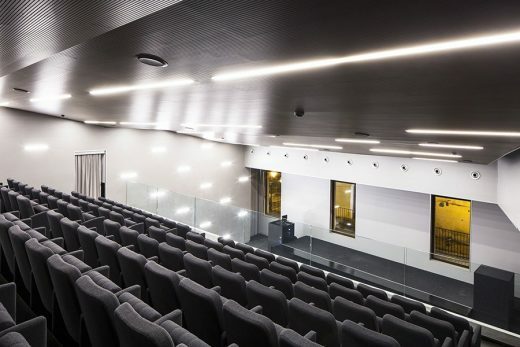 The auditorium has an area of 1.300 square meters, divided into four levels and a basement for the archives of the bank and technical rooms. On the first level there is the foyer that opens on the main street through five portals; the second level includes the auditorium hall with about 280 seats; the third level is dedicated to a gallery for 130 seats; at the last level there is a meeting room and a terrace between the facade and the monolith. 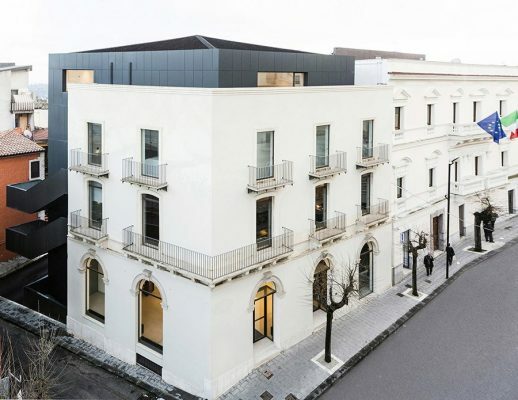 FABBRICANOVE chose a grey anthracite cladding for the skin of the new volume in order to make it visible and to create a dialogue with the white plaster of the reconstructed facade. 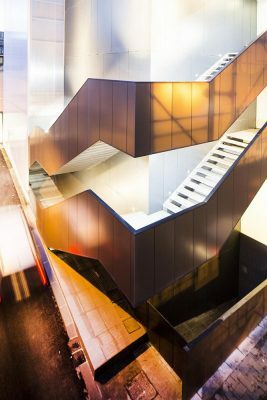 The coating of the external volume has been realized with vertical cut panels, to obtain a precious texture, which works as a ventilated facade. 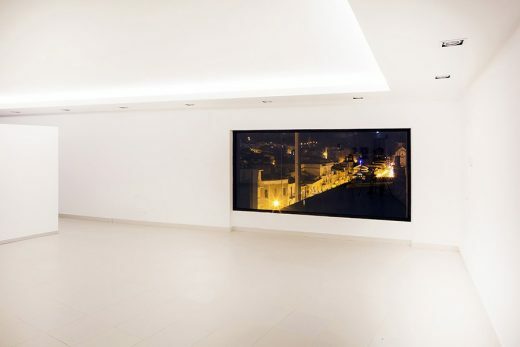 The project arises into the context as a decisive and clear overlay. The structural system is a significant element of the project. The structure is concentrated in the perimeter of the monolith, and this allows to have an open space with spans of up to 20 linear meters. This solution creates a void, a gap between the reconstructed facade and the monolith, where all the distribution system is located: stairs, elevators and entrances. 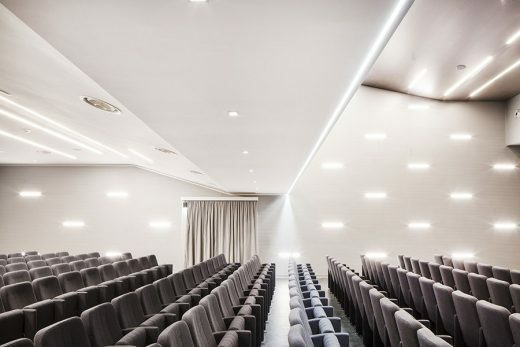 The new auditorium confirms the design approach of FABBRICANOVE to the urban scale: declares a new ‘presence’ in the urban context through the stratification of the new functional program and through an absolute and clear summary of its formal and symbolic essence. “The project for the auditorium of B.C.C. is placed along Corso Vittorio Emanuele, the main street of San Cataldo, in the province of Caltanissetta. 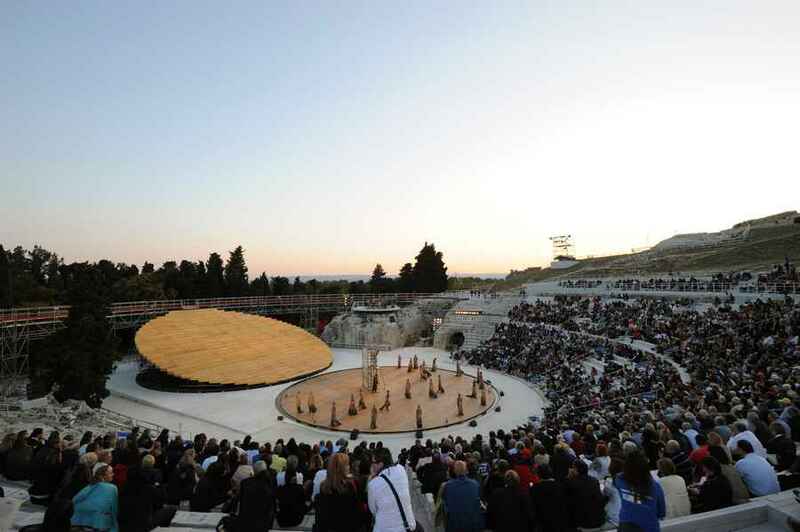 An auditorium for the bank but with public vocation for cultural events, open to the citizens. 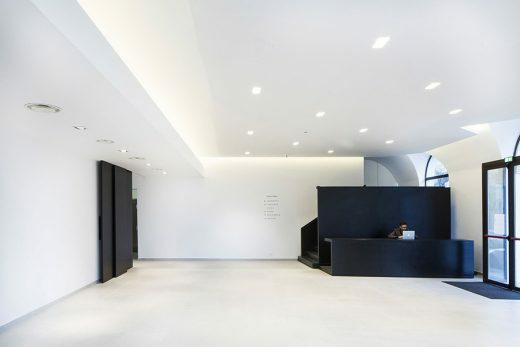 The project takes part of an important urban transformation process, which in a decade has involved the restoration of bank’s office, the square in front and the parking lot of the bank. 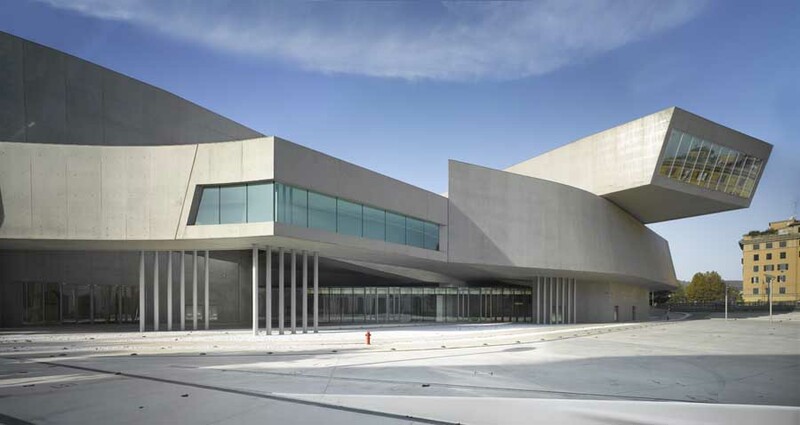 The planning solution involves the reconstruction of the historic facade on Corso Vittorio Emanuele, as prescribed by the constraint of the Superintendence of Cultural Heritage, while the volume dedicated to the new functions of the auditorium is placed behind the rebuilt facade, which becomes an urban scenic backdrop. FABBRICANOVE is an architectural and urban office founded in 2009 in Florence by Enzo Fontana (1974), Giovanni Bartolozzi (1979) and Lorenzo Matteoli (1977) with the objective to examine design languages and new essences of the contemporary project and to activate a debate for the fundamental transformations that concern a big part of the current urban reality. 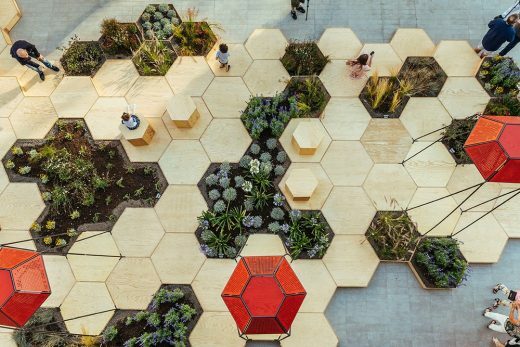 The studio uses as a main research tool the design competition, through which it examines thoroughly the topics that review the city and the public space. 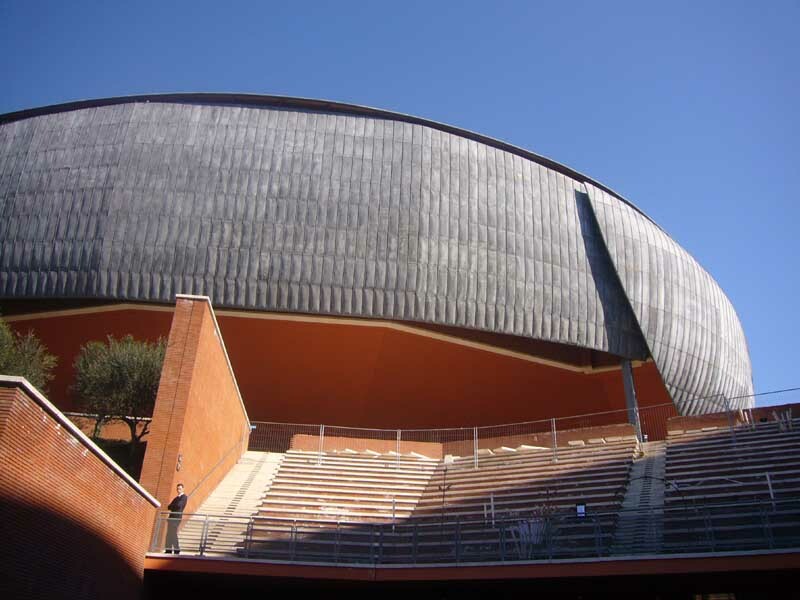 In 2009 the studio won the international competition for the requalification of Forte San Pietro di Livorno. 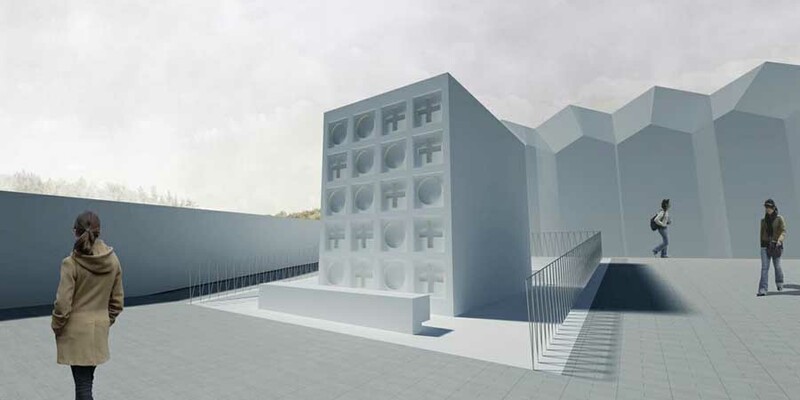 The winning project presents the restitution of a space with strong public vocation by transforming the fortress in a museum park, designed as an urban joint between the maritime station and the historical centre. Still in the same year FABBRICANOVE won the competition for “La casa del III Millennio”, organized by CNA of Prato and Arezzo, with the project ”Luna 9”; while in the edition in 2011 the studio was selected for the design of the table ”alfa 001”. In the next years the studio have obtained important positions in several international competitions, among which it is the honorable mention in the competition for the realization of a didactic complex in the municipality of Malles (Bolzano, Italy). FABBRICANOVE has developed a numerous public assignments, activating a fruitful experience in collaboration with public administrations. Among the most recent projects there are the restoration of the monumental complex of Santa Chiara in Sansepolcro (Arezzo, Italy), a work that was just inaugurated, the renovation of the monumental complex Town Hall/Theatre di Pieve S. Stefano (Arezzo, Italy), the restoration of Palazzo Montanelli della Volta in Fucecchio (Firenze, Italy). All the interventions are upon protected buildings in accordance with T.U. for Cultural Heritage. The studio has also recently coordinated The Urban Implementation Plan for the new headquarters of Cooperativa Muratori e Cementisti (CMC) in the field of urban requalification of the wet dock of Ravenna (Italy). Furthermore, FABBRICANOVE is committed with numerous private commissions, among which the project for reconversion of the historical college ”Alla Querce” (Florence, Italy) in an accommodating complex, the Auditorium of San Cataldo Credit Cooperative Bank (Caltanissetta, Italy), a winery of 4000mq in Baratti (Livorno, Italy), the extension of a Health Assisted Residence located on the seafront of Savona. Concurrently with the professional activity, the members of FABBRICANOVE performs didactic activity as professors in architectural design courses at the Faculty of Architecture in Florence and at Kent State University in Florence.